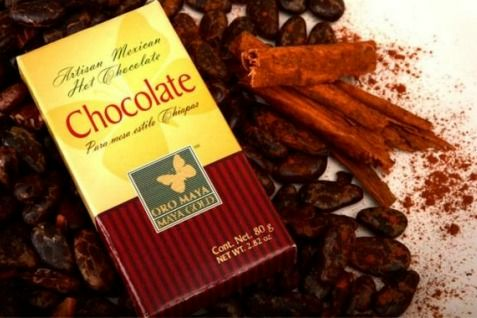 Oro Maya are the Best chocolate bars for preparing traditional Mexican Hot Chocolate drink. Made from Premium cacao beans from Chiapas, Mexico one of the largest cacao and coffee producing region in Mexico. It�s main ingredient, cacao beans are carefully selected, roasted and grounded preserving all their natural benefits. Widely recognized in Germany, Switzerland, Netherlands and Japan. Grown and processed under sustainable practices along with small producers. 1) Melt 1 chocolate bar in a pot with 2 cups of hot milk or water. 2) Mix with Molinillo, spoon or blender and stir until fully melted. 3) Froth and serve. Enjoy! De la Planta a la mesa amigable con la Naturaleza - Chocolate para Mesa Estilo Chiapas. De la Planta a la Mesa Amigable con la Naturaleza. Best Hot Chocolate I've ever had! I love this stuff. We bought some in Cancun and absolutely love it. We mix it with 1 -3/4 cups milk and 1/4 cup cream. Hope it is back in stock soon!